Library resources for Dental Assisting students. "A reference for all who need clear explanation of medical terms: nurses, health care professionals and students, health service management, actuaries, lawyers and journalists." "Covers topics in body systems and functions, conditions and common diseases, contemporary health care issues and theories, techniques and practices, and devices and equipment. The Encyclopedia covers all major health professions, including nursing, physical therapy, occupational therapy, respiratory therapy and more. " Search the Library Catalog to find books, eBooks, and periodicals. You can search by keyword ("everything"), author, title, or subject heading. The results list will give you basic information about each item, including availability. To find out more, click on Details. 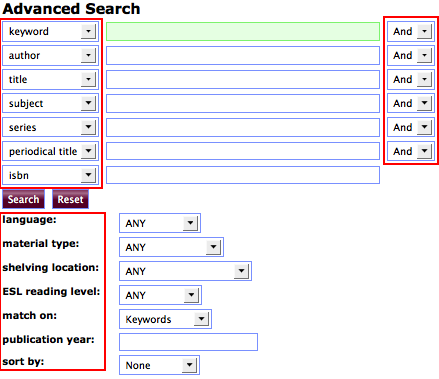 Using the advanced search, you can search by any combination of keyword, author, title, subject, series, periodical title, or ISBN. You also have the option to search by language, material type (such as book, e-book, video, etc. ), shelving location (e.g. reserves, reference, media center), ESL reading level, and more. You can also use the Boolean operators AND, OR, and NOT to narrow or broaden your search.